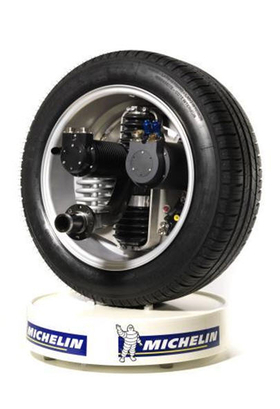 Michelin's Active Wheel technology is a standard wheel that houses a pair of electric motors. PARIS -- Valeo and Michelin plan a partnership to develop and produce all-electric and plug-in hybrid electric cars. "We will develop a powertrain system and the car will be built around it," Valeo CEO Thierry Morin said Friday. Morin said the companies hope to build a "French champion" in the electric car sector. The companies are seeking an automaker to join a consortium that will build vehicles around Michelin's Active Wheel technology. "We may team up with a French firm or it may be a Germany company," Morin said during a press conference after announcing the company's 2008 financial results. "What's really interesting is the know-how Michelin has developed." Paris-based Valeo is one the world's top auto suppliers and Michelin, of Clermont-Ferrand, central France, is a leading tire maker. Michelin's Active Wheel technology is a standard wheel that houses a pair of electric motors. One of the motors spins the wheel, while the other acts as an active suspension system to improve comfort. Michelin says battery or fuel cell-powered Active Wheel cars will not need a gearbox, clutch, transmission shift, universal joint or anti-roll bar. With Michelin providing key elements of the powertrain and tires, Valeo will concentrate on engine and battery cooling systems, climate control, lighting, and energy management. "We have a long experience with electric cars and we are expert in these areas," Morin said. Valeo's cooperation with Michelin is part of a plan to concentrate its r&d on environmental protection applications, which the supplier sees as a key driver of future growth. The company reported a 9 percent drop in sales and a 207 million euro net loss for 2008, which Morin attributed to both the global slowdown and one-time charges for its plan to reduce headcount by 5,000 during 2009.